San Pedro de Atacama – ¡Vamos! Rocks, sand, and stars! That basically sums up what we saw in San Pedro de Atacama. It is a desert town in northern Chile that seems to be catered toward tourism (and it naturally attracts scientists). It’s considered the driest place in the world with only 15mm of rain on average each year. It’s a good base to explore the amazing desert landscape and skies. Random observation I must note. There are stray dogs (and some cats) all over town, much like every other city and town we have been in so far. However, the ones here are unbelievablably huge! All of them! I think locals and tourists like feeding them. 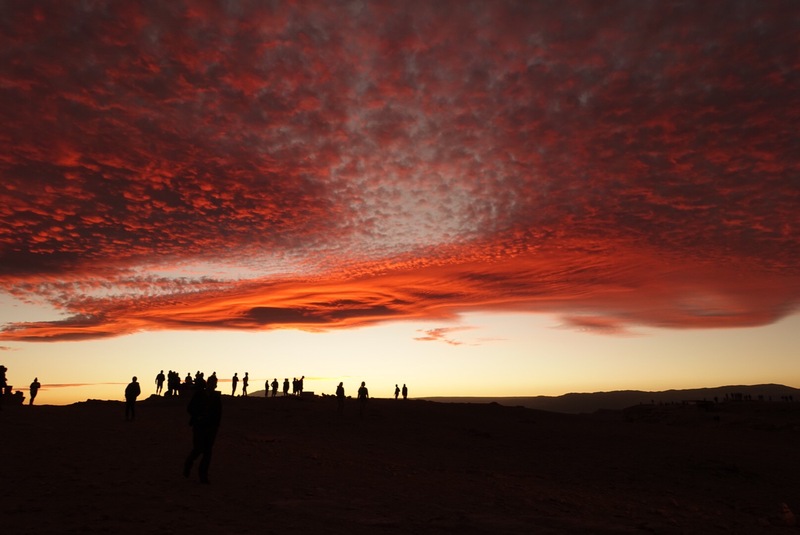 Because there are so few cloudy days in the Atacama desert, astronomers from all of the world flock here to study our universe. We did a tour with Space Obs and used 10 telescopes to see galaxies, stars, and planets! We learned about the history of astronomy, a bunch of names and stories of stars that I hope I’ll remember, and some technical stuff. Our guide was an astronomist from Canada and his humor was the same as all my high school science teachers. It was entertaining. Instead, we decided to spend a day biking in the brutal afternoon, desert heat through the Valle de Catarpe. It was a half day ride (considered medium level of difficulty) through a valley located 16 km or 9.9 miles from San Pedro de Atacama. On this route we visited the Pukara de Quitor ruins (3,000 CLP per person) and the amazing Quedabra del Diablo (Devil’s Gorge). Pukara de Quitor is the ruins of a pre-Inca fortress that the Atacameño people used to defend themselves from the Aymarans (that we learned about all over Peru and Bolivia) and later the Spanish (of course). I was too tired to climb up the ruins and to the viewpoint so we just looked at it from below and read about its history. The Devils Gorge was the definitely the highlight of our ride. It was really cool biking through these amazing rock formations with little to no one else around. It felt like we had the entire valley to ourselves.